There are allegedly 800 million bikes in the world, double the amount of cars, and they are a very efficient and eco-friendly way of getting around. Children love the speed and independence gained from having a bike, no matter how small they are, and BMX and mountain biking have re-invigorated generations of cyclists who just used to use them to go to school on. However, on increasingly more crowded roads, cyclists are at risk of accidents and children especially, generally because they don't have the right protective kit on or simply aren't seen by the motorist. According to Transport Research Laboratory data, child cyclists make up just 6.6 per cent of road cyclists, yet they account for a disproportionate number of accident deaths. Government figures show that child cyclists are more than three times more likely to die on Britain's roads than adult cyclists and that seventy per cent of all cycling deaths and over half of all cycling injuries involve a head injury. What Can You Do to Minimise the Risks to Your Child? 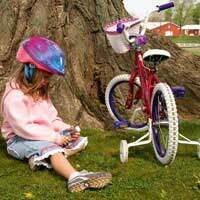 Research has demonstrated that cycle helmets can reduce the severity of head injuries by up to 85 per cent. Invest in one - some schools have it mandatory for all children who cycle to school to have one - it could save their life. If you let them choose from the multitude of funky patterns available now, they'll be more likely to wear it. Riding gloves and knee and elbow pads protect joints and 'knock zones' - especially important in warm weather when riding about in a t-shirt and shorts or when first learning to ride when those all important stabilisers come off! Lights and reflectors (not one or the other) - front and rear and on the spokes - keep them clean or they won't be seen! Push your bike if the lights run out, there's no such thing as 'just a short distance'. Bell/horn - even if they can't see you, they may hear you, especially pedestrians who step onto the road or cycle lane without checking. Make sure it works every journey. When parking a bike, make sure they do it on the pavement, not on the kerb as leaning over can put them in the path of a car. Basic bike checks for safe cycling are simple things and should become second nature for your child each time they ride their bike. Most children love to tinker with their bikes and get good and greasy doing it; so encourage them to be their own mechanic but just check they are doing it right until it is second nature. Look at it as a good weekend bonding opportunity! If you take the saddle off when you lock it up, make sure the quick release is good and tight when you put it back on! When you want to teach your children basic road safety on a bike, there's no better way than by example. Either you or your partner should go out with them and explain everything that's going on and what you're doing and why. Keep them in front of you so you can see them. Use pedestrian/pelican crossings where possible to change direction. Watch out for roadworks and make it clear with hand signals that you are going to swing out round them. Junctions are hot spots for cycle accidents as cars can pull out onto the road you are on without seeing you - be aware that they are there so you can stop if they can't. Stick to the cycle lanes where they are marked, just watch out for pedestrians. Give parked cars a wide berth in case they decide to open their doors onto you. Drain covers and grates become very slippery in the rain, as do some types of road and pavement surfaces so watch out for those as they are easy to lose tyre grip on. Explain that traffic lights apply to cyclists too - any road user in fact - and they are breaking a law by shooting them. Watch out for dogs - they love to chase things and bikes are often fair game!